Whilst many people spent yesterday consuming turkey and opening presents, I was hiding away from all the festivities and indulging in something I like much better - sorting out the Sidepodcast wiki. When we first opened up the wiki way back when, I didn't think we would be leaving a trail of abandoned sites in our wake. However, after moving away from Wetpaint, and the tale of woe that was Wikia, we have finally found our home. The choice ended up being between ditching the wiki or hosting it ourselves, and there was far too much good stuff to throw it all away. 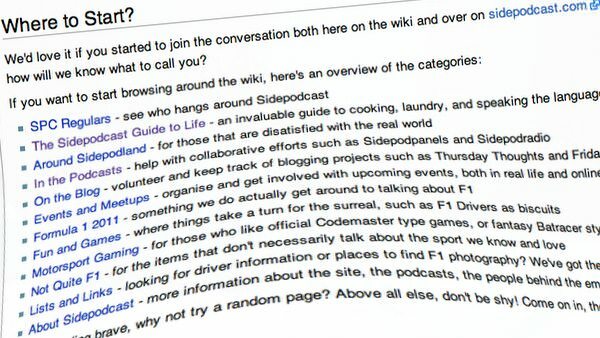 Welcome along, then, sidepodcastwiki.com. It's taken just over a month, but the wiki now has everything that was hosted previously, including all pages, updates and pictures. I cannot guarantee the formatting has survived the move, but I have done my best. If you have a specific page you were keeping an eye on, I would recommend double checking to see if it needs tweaking. There are two main changes to the way the wiki works now that it is hosted by us via MediaWiki. As far as I can tell, you have to register for an account. We've always tried to keep the wiki open, but having seen some of the spam changes that occurred on Wikia, I think keeping track of who changes what isn't such a bad idea. It's free and easy to set up an account on the wiki, though, and everyone is welcome and actively encouraged to do so. Editing pages means using the specific forum language that can take a bit of getting used to. Now that there are plenty of pages in the wiki, it's easy to find something similar to what you want and copy/paste your way to success. I'm also intending to set up a page with some quick reference notes for editing - mostly for my own use, but there if anyone else wants a reminder of the strange language we have to use. So, there are some compromises we have had to make to keep the wiki up and running, but I think this will make it even bigger and better. Whilst perusing my way through the pages to make sure I had everything moved across, I came across some excellent and long-lost gems. To counter this, I've decided to take time out each month to highlight a page or two on the wiki. Let's start that right now! We spend quite a lot of time chatting about music in the comments, particularly with the glorious Giggles Radio, so it seemed only natural that the conversation turned to what your first foray into music was. Owning up to the first single and first album you purchased is quite a big thing, but we don't judge here on Sidepodcast. In fact, the worse it is, the better. Mine includes Sean Maguire and All Saints, which isn't so bad. There's some Eurythmics, Lighthouse and Peter Gabriel, which is all far too sensible, but we do have Bassano admitting to owning some Smurfs singing. Nikki revealed that her family works in the jukebox business, so she had to access to all kinds of music without actually having to buy any. That's the life! I'm sure you have a story to tell too, so why not head over and own up to where your journey in music began on the Music Initiation page. Any problems or questions, let us know, and we'll try to help, but don't forget that we are new to this whole MediaWiki thing too. Together we'll work everything out and the wiki will get even more fabulous.